OK 156 was once part of U.S. 77. 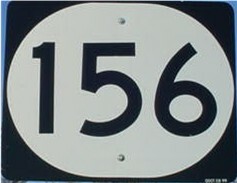 OK 156's current southern terminus is at a Y-intersection known as Three Sands Junction. U.S. 177 once began at that intersection by heading north from there along current U.S. 77, which then went off to the east, went through Marland, then intersected U.S. 60 west of Ponca City. U.S. 177 was then realigned to go east on U.S. 60 in Tonkawa to Ponca City, then south along all of old OK 40 and part of then-OK 18 to end at U.S. 70 in Madill. The north-south section of highway between Three Sands Junction and Tonkawa was then renumbered U.S. 77, and old U.S. 77 became OK 156. OK 156 connects the current U.S. 77 south of Tonkawa to U.S. 60/U.S. 77/U.S. 177 west of Ponca City. Its existence as a U.S. highway is evident on parts of the highway, with wider shoulders and older bridges. "END OK 156" sign at U.S. 77 as OK 156 South concludes. River. This old bridge is a remnant from the road's days as U.S.
Somewhere in this mix of shields, there is an "END OK 156"
OK 156 North at U.S. 60 West/U.S. 77 South/U.S. 177 North. Southbound N3290 Rd. on what is about to become OK 156. OK 156 South at U.S. 60 East/U.S. 77 North/U.S. 177 South.